President Donald Trump’s daughter and senior adviser, Ivanka Trump arrived in Ethiopia on Sunday as part of her four-day tour to Africa on behalf of a White House global economic project intended to boost 50 million women in developing countries by 2025. After her arrival, she discussed with Ethiopian women entrepreneurs engaged in coffee business and wavers in the capital Addis Ababa. She also visited a textile and handicrafts company and the Ethiopian Women’s Coffee Association, where she met with Sara Abera, the owner of Muya Ethiopia, a leading textile and handicrafts company. The company got its start through the assistance of the United States Agency for International Development (USAID). The delegation toured the Muya Ethiopia production facility, met with employees, learned more about Sara Abera’s experiences as a woman entrepreneur in Ethiopia, and heard about the impact of businesses like hers in creating local employment and economic opportunities. Pillar two of the new Women’s Global Development and Prosperity Initiative (WGDP) aims to empower women as entrepreneurs by increasing their access to financing, market opportunities, mentorship, and training to establish and grow their businesses. In that spirit, Ms. Trump announced a new W-GDP award to expand the Muya business with the signing of a letter of interest for financing between Muya and the Overseas Private Investment Corporation (OPIC). 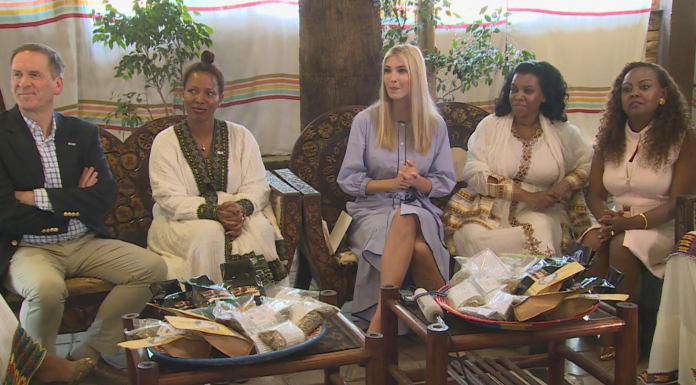 During her stay in Addis Ababa, Ivanka met senior Ethiopian government officials including President Sahilework Zewude and the African Union, women leaders with the business community and civil society.